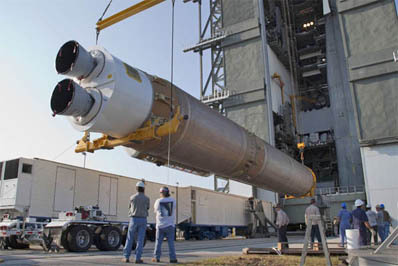 United Launch Alliance's Atlas-Centaur rocket has been put together for deploying the Air Force's third Orbital Test Vehicle flight, a mission that will demonstrate the reusability of the X-37B spaceplane when it blasts off Oct. 25. The bronze first stage of the vehicle was erected atop the mobile launch platform inside the Vertical Integration Facility at Cape Canaveral on Thursday, Sept. 13. After setting the interstage adapter hardware in place, the Centaur upper stage was hoisted high into the assembly building on Saturday, Sept. 15. 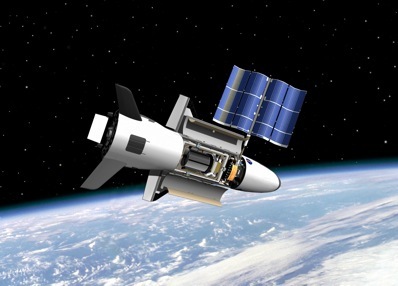 The upcoming spaceflight will be the second for this particular X-37B vehicle, which spent 224 days, 9 hours and 24 minutes aloft between April and December 2010 on the inaugural OTV shakedown cruise. A second vehicle spent 468 days, 13 hours and 2 minutes on a voyage from March 2011 to this past June that circled the globe more than 7,000 times. Watch a video of the OTV-2 landing and see a collection of post-landing photos. Now, the maiden spaceplane is poised for its return to orbit on another hush-hush mission of unknown duration or exactly what it is carrying in the payload bay. "We are on track to launch OTV-3 in October," said Maj. Tracy Bunko, an Air Force spokeswoman at the Pentagon. "As with many other advanced technology test programs, some details of the mission and test requirements are classified or sensitive. The focus of the program remains on vehicle capabilities and proving the utility and cost effectiveness of a reusable spacecraft." With pickup truck-size cargo bay, seven feet long and four feet wide, the stubby-winged craft could be filled with equipment being exposed to the harsh environment of space for proof testing or could contain experimental instruments intended for use by future military and reconnaissance satellites. The planes' unique capability to drop from orbit and land on a runway allows technicians to get their hands on the hardware after it spent more than a year in space. "One of the most promising aspects of the X-37B OTV is it enables us to examine a payload system or technology in the environment in which it will perform its mission and inspect them when we bring them back to Earth. Returning an experiment via the X-37B OTV enables detailed inspection and significantly better learning than can be achieved by remote telemetry alone. Experiments can then be modified and reflown, allowing us to mature technology faster," Bunko said. Built by Boeing's Phantom Works division, the miniature space shuttle is 29 feet long with a wing span of 15 feet, made of light-weight composite structures instead of aluminum and shielded with improved leading-edge ceramic insulation panels on its wings and tougher silica tiles affixed to its belly that are designed to be more durable than first-generation tiles used on the manned shuttles. It can weigh up to 11,000 pounds fueled for launch. The in-space design life is 270 days, but good performance on the last mission enabled ground controllers to keep it aloft significantly longer. "As with previous X-37B OTV flights, the mission duration is driven by completion of the test objectives rather than any specific date," Bunko said. The Atlas first stage, with its RD-180 main engine burning kerosene fuel and super-cold liquid oxygen, will fire through the initial five minutes of flight. The cryogenic Centaur upper stage filled with liquid hydrogen and liquid oxygen then ignites for its only burn needed to heave the 5.5-ton payload into low-Earth orbit. The launch sequence on OTV-1 and OTV-2 took about 19 minutes from liftoff to spacecraft separation. It's the 501-version of the Atlas 5, a rocket that employs the five-meter-diameter nose fairing to shroud X-37B during ascent through the atmosphere and no strap-on solid-fuel boosters. Although the exact target launch time has not been revealed, liftoff is expected in the late afternoon or early evening from Cape Canaveral's Complex 41.